German bankruptcy? When will Germany default? Moody’s threatens Germany downgrade. According to "Die Welt" there are 4 faults that doom the Euro. No heroic attempts will save the Euro. Rather will doom Germany, too. Germany is giving loans and guarantees assuming a Trillion Euro in guarantees for doomed countries. Several times its yearly budget of just over 300 Billion Euro. And this is before the unlimited rescue packages for the bigger countries like Italy and Spain. Mistake 1: All people are equal. Germany developed solar and wind energy, while Greece, Spain and Portugal have much twice as much wind and sun. The latters simply lack the inventiveness and energy of the Germans. Mistake 2: Lower interest (in Southern Europe) decrease cost of government debt and create growth. Changing from Drachma, Escudo, Lira to Euro decreased interest rates from 10% to 2%. Instead of using the gains to pay back government debt, these countries went on a spending spree. High government expenses please voters. Greek government salaries doubled in 10 years. Note that Germany, Sweden manage austerity measures (see Mistake 1). Spending and growth were based on borrowing, while the economy was destroyed by cheaper and more efficient German production. Mistake 3: one same interest 2% level levels differences Germany’s support payments caused a boom in Spain. 2% interest loans with 3.5% inflation really invites overspending. Germany should have lower interest rates of 1% (and thus more growth and consumption. Southern countries should have had 6%-7%. interest rates. .Target 2 debt owed by the South to the North accumulated to about 1 Trillion Euro of unpaid (and unpayable) debt. The signs of doom were visible for a decade, but were swept under the rug until the problems became huge and unmanageable. The unavoidable doom of Greek, Spanish and other countries finances will be delayed by Germany taking unmanageable unlimited risk. Thus Germany might sink together with these countries. The iron-clad "no bailout clause" was simply violated, just as debt limits. So there is no reason to believe that any new agreement will be kept, in the long run. 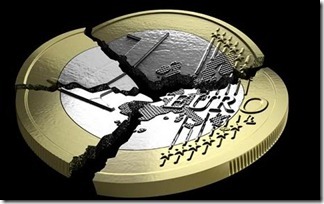 The Euro was doomed from the start. The idea that a common currency can join Europe into a unity has proven to be flawed. It is destroying European countries and create serious irreparable hostilities between nations. False dogma and political correctness cause suffering. Germany is guaranteeing several years of its federal budget to other countries. Author Human-Stupidy (Admin)Posted on July 27, 2012 July 27, 2012 Categories EconomicsTags Euro, Greece, austerity measures, bankruptcy, cultural diversity, debt crisis, default, economy, euro countries, euro debt, false beliefs, political correctness, target 21 Comment on German bankruptcy? When will Germany default?